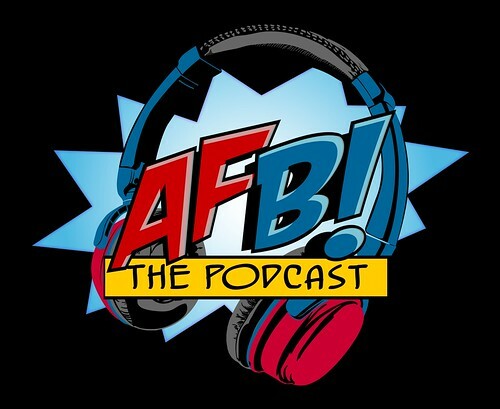 Episode FIFTEEN of the AFB Podcast is live at iTunes and is now available for direct download! Download and subscribe to the podcast at iTunes now! Join Ben, Scott and Adam from the AFB Forum for Episode Fourteen of the Action Figure Blues Podcast! The AFB Podcast is a weekly look at action figures, statues and other collectibles from the worlds of comic books and popculture. Episode Fifteen includes our Toy of the Week feature on the Kai Arts Play Street Fighter IV Chun-Li Action Figure, with a discussion on Playsets. If you can't use iTunes, you can download Episode Fifteen here now! Click on the link to listen, or right click to save the file! The podcast will always be available from the “Podcast” tab here - but if you can subscribe and give us positive ratings at iTunes, that will help us greatly! It's time for another one-on-one conversation with one of the AFB Podcast Hosts, and this time around it's the turn of our friend Justin! 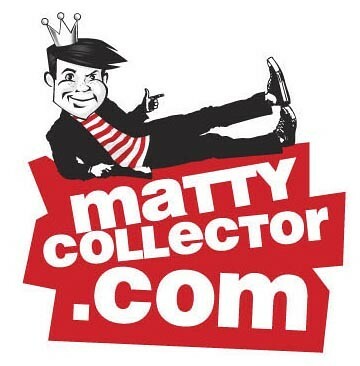 You'll learn exactly how Justin became the collector he is today, hear about his main toy collecting interests and wishlists, and gain some other fun insights along the way! You can download Episode 2 of the AFB Q&A - an interview with Justin "NiteOwl" Ayshord, direct from our site now. For iTunes subscribers, the show should be available shortly! Marvel Select is becoming the little action figure line that could in my book. 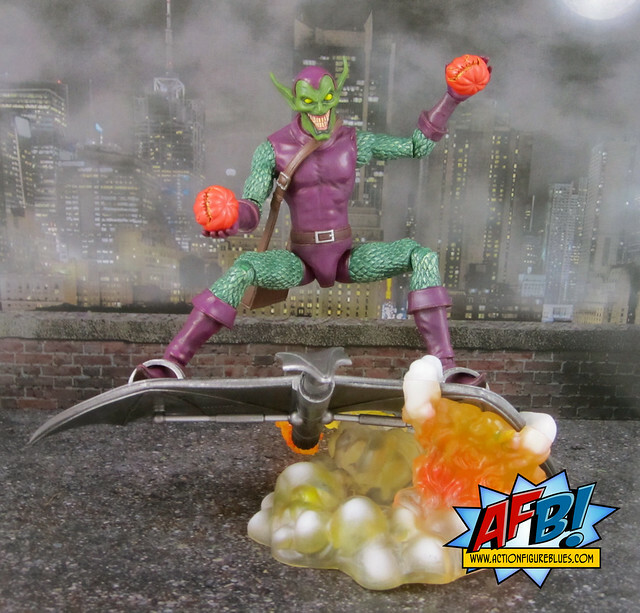 Their latest release, the Marvel Select Green Goblin Action Figure, is one of the most exciting figures to come out of the MS line in recent times. I usually start with sculpt and work my way down to accessories, but I’m going to start this review with the “extras”, because they are so great! One of the features of the Marvel Select line is some form of highly detailed pack-in base or prop, which usually end up in a storage bin in my house as I don't have the space to display them. The pack-in in this instance is the best form - a great little replica of the Goblin Glider. This is the kind of extra I'm happy to pay for, as it doesn't take up much extra space in the display and adds a great deal to the visual appeal of the figure. Taking this particular accessory over the top is the fantastic cloud of energy and smoke it rests on and which forms a supportive base for the figure. It’s an exciting burst of colour with some translucent elements, and it’s a unusual shape that looks like it shouldn’t balance the glider, yet it does that perfectly. This is the sort of pack-in that will keep me coming back for more! There are other accessories for this action figure - a satchel and an extra hand with a pumpkin bomb attached, which are nicely done and add a great deal to the overall package. As for Mr Goblin himself: the articulation of this figure is outstanding. I am on record at not being the best at posing figures, but even with my limited skills there are a number of great poses that can be easily achieved with this figure. There would be nothing worse than having a great pack-in like the Goblin Glider but not being able to pose the figure properly on it - that's definitely not the case here. 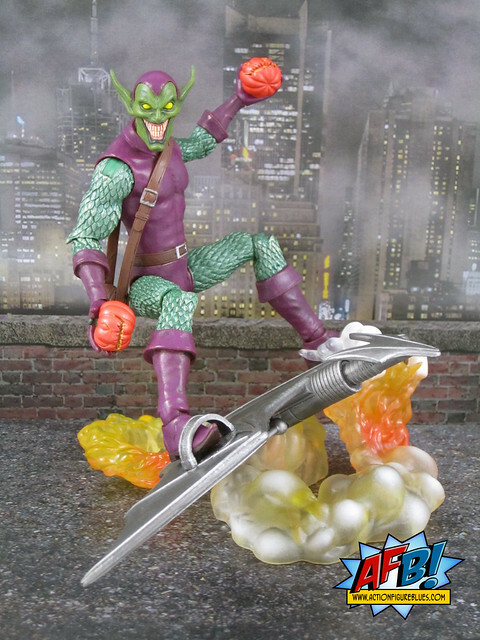 The ankle, knee and hip articulation of this figure makes it possible to get some great poses with the Green Goblin astride his flying machine. The sculpting job is excellent - there is a fantastic amount of detail throughout this piece. His headsculpt, including freaky teeth, is brilliant, and the scales on his arms and legs are very nicely done. His gloves and boots are also nicely detailed. There are two things that I have to criticise about this figure. One is an artistic choice, and one I think is a QC issue. Something that I find a bit peculiar about this figure is the lack of pupils in Green Goblin’s eyes. When think about Green Goblin’s look, his tiny pupils in the middle of his large eyes is part of what creates his unhinged, crazed look, and I think this figure ends up feeling just a tad “off” because these are missing. The other issue is about colour choices. 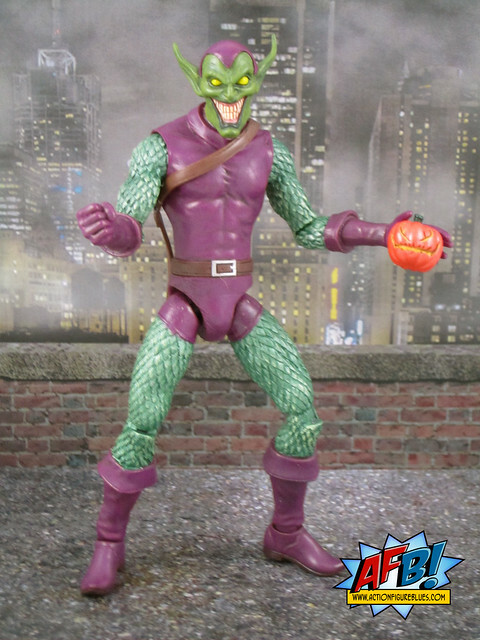 The green of Green Goblin’s skin on his face doesn’t match the green on his arms and legs. I’m not sure if it’s just because the limbs have a metallic edge to them, or because the greens are just different, but they are not the same. I have to say this didn’t really strike me until I was processing the photos of this figure, so it’s not jarring at first sight, but it does seem odd. There is so much “right” about this figure that neither of these are fatal flaws in my book. I love the articulation, the ease of posing this figure and the excellent, excellent Goblin Glider With Included Energy And Smoke Cloud. This is a must buy in my book! 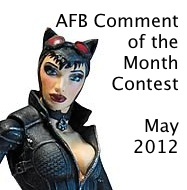 You can see more pics at Facebook, discuss this at the AFB Forum, and comment on this post to enter the May AFB Comment of the Month Contest! It's time for another round of questions and "answers" from Mattel as AFB Asks Matty! In an AFB First, we got the exact same answer to two questions, including the same typo! Q: Is the Death figure on offer at SDCC an indication of where Mattel's future DC offerings will go? A: It is a form factor we are exploring. Right own (sic) there are no further concrete plans but we are curious to see how well this item does. Q:Why Death and not Sandman? When will we see Sandman? A: Over the years fans have often criticized our female 6" figures so we wanted to try something new and start with a female since this statue form factor lends itself well to female anatomy. Q: Will Club Lion continue in 2013? A: It is too early for us to comment on 2013 at this point for any brand. Q: Have we seen everything there is to see in terms of Mattel SDCC Exclusives? A: We have yet to reveal some details for the Hot Wheels, Monster High and Dark Knight items. Q: The SDCC Tiny Titans set is awesome! Is there a possibility we might see future Tiny Titans toys if these do well? That's all for this round. 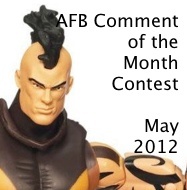 You can discuss this or add questions for future rounds at the AFB Forum, or comment here to enter the May Comment of the Month Contest! 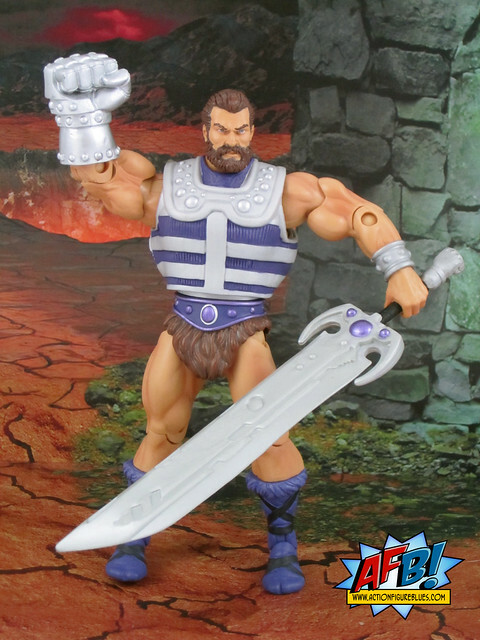 It’s been quite some time since I reviewed any items from Mattel’s Masters of the Universe Classics line. There are a couple of reasons - first is that I once I got a bit behind with these the backlog grew very quickly, and the second is that thanks to a snafu of the Digital River kind it looked for a moment like my Club Eternia Subscription was going to be cancelled, in which case I would have given the line up out of sheer frustration. Things did come good in the end after I went as far up the tree as I could for help (if you’ve been listening to the AFB Podcast you may recall this saga) and so I thought I better pick up with my MOTUC reviews again. The recent arrival of a box containing three significant characters in the line, Sorceress, Fisto and Shadow Weaver, seemed like as good a place to pick up as any! 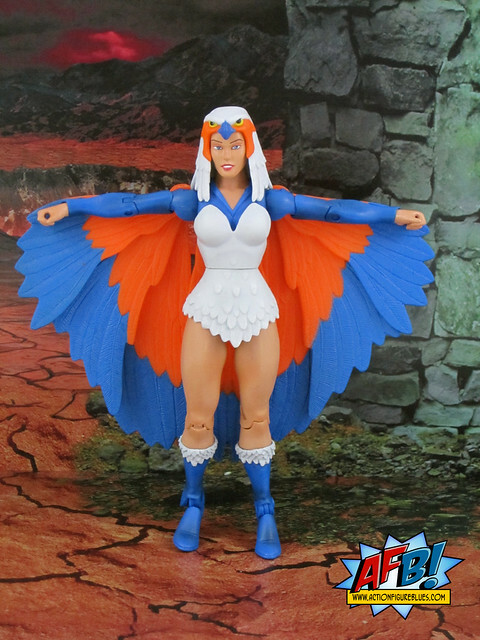 Sorceress is a key figure in this line and would certainly be counted as a much-awaited figure, both because of her important role in the MOTU universe and her visually striking look. She would have to be one of the most instantly recognisable He-Man characters. I have read a fair bit of criticism about this particular figure, but to me it is very well done when you consider the constraints of working with a standard buck and only a certain budget for custom tooling. Her wings are well constructed with a series of individual pieces that provide a decent wing span. The Sorceress also comes with her falcon form, Zoar. I don’t know if all of the birds in the original He-Man mythos were designed to make the most of a single mold, but Mattel has certainly made the most of it! What I will criticise about the Sorceress figure is the hands. A character whose main schtick is flight really needs some sort of outstretched hand for flying, not two semi-closed hands that can be posed in a “thumbs-up” pose. Mattel seems to deflect questions about hands that suit the character (to hold accessories, demonstrate powers, etc) back to “Four Horsemen sculpting decisions”, but to me this makes little sense - I’m sure it’s about tooling and cost. When you’re using standard bucks such as these it seems like there would be merit in creating options for hands in different poses so that they can be used logically - definitely not the case here. Fisto is definitely one of the strongest figures in the line in quite some time. He has a distinctive, hokey look which has been faithfully updated here and he makes a visually striking figure. The sculpt is very strong, with clear lines and great paint to support them. His massive right fist is beautifully done. I particularly like the fact that despite the fact that Fisto’s namesake is nicely sculpted and has some weight, he can be posed in a number of ways without the fist overbalancing him. This speaks to the solid and well designed basic bucks that feature in the MOTUC line. We were told not to expect any more 200x heads, but Fisto comes with one. Weird in terms of Mattel communication, but great for us. I definitely prefer the head without the man-tiara (which has a matching WWE-style belt) but it’s great to have options for display. In addition to the swap-out head, Fisto comes with some great weapons a rather average purple sword and then The Sword To End All Swords - which has to be one of the most awesome MOTUC weapons ever! 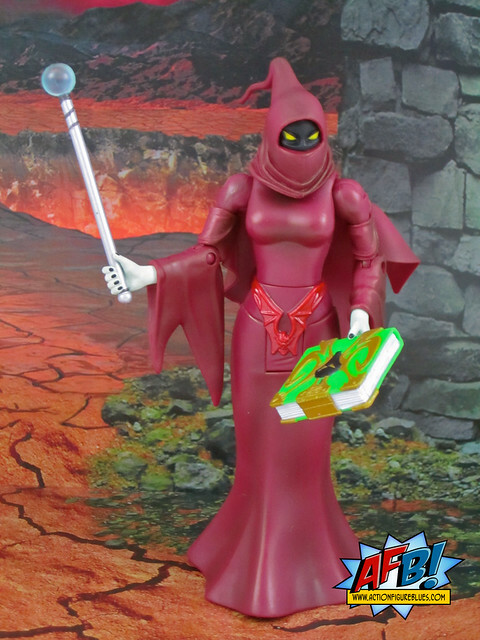 The Club Eternia Subscription Exclusive for the year is Shadow Weaver, the Horde Witch. 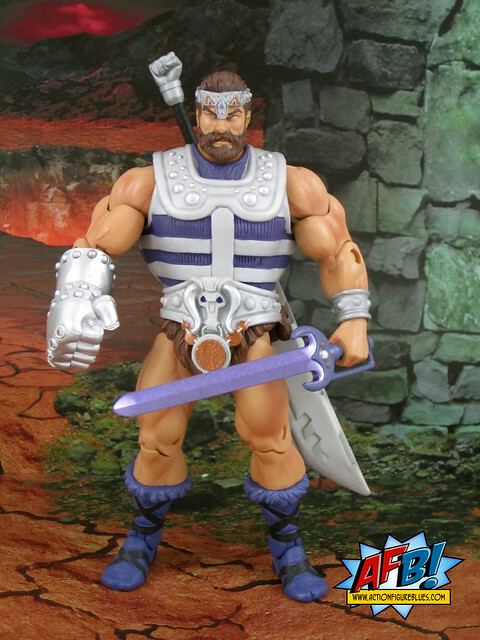 This is a significant figure in the line for a number of reasons - it is the first Club Eternia Exclusive to come from the She-Ra side of the MOTUC family tree, and a figure that is comprised of what seems to be entirely new parts. It’s also a figure that seemed unlikely to be made when this line first started, as she is a Filmation character which Mattel only recently acquired the rights to. Making Shadow Weaver the Club Exclusive for 2012 most certainly would have given sales a boost, due to her status as a long-demanded character. In my estimation, the wait has been worth it, as the Four Horsemen have done an outstanding job on this figure. The sculpting of this figure is outstanding, from the very distinctive headsculpt to her long, ragged sleeves to her flowing gown. Her cape is constructed and attached in a way that does not limit the movement of her arms, and her hands are also new sculpts. Shadow Weaver has been sculpted without articulated legs - instead her cape forms the base of the figure, which makes her sturdy and easy to stand. She has a hollowed out underside so that a stand can be inserted to give her extra height and a floating look. This is an optional stand which provides choices for display. I like the extra height as it creates levels in one’s display. The figure comes with two accessories - a wand and a spell book which I understand each appeared in a Princess of Power episode - a very nice touch. The paint job is excellent, with a dark wash used over the purple to provide some depth. 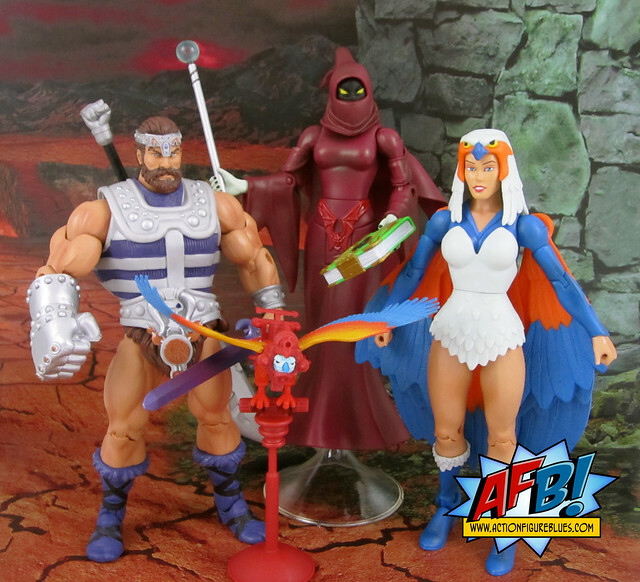 I am not yet prepared to commit to the 2013 Club Eternia Subscription, because I feel that the gaps between “hits” is getting longer and it may actually be cheaper to spend a bit more on the secondary market for the remaining characters I do want. Having said that, I would definitely put all three of these characters into the “hits” category - I just wish this was representative of every month of MOTUC! Episode TWELVE of the AFB Podcast is live at iTunes and is now available for direct download! Download and subscribe to the podcast at iTunes now! Join Justin, Scott and Ben from the AFB Forum for Episode Twelve of the Action Figure Blues Podcast! The AFB Podcast is a weekly look at action figures, statues and other collectibles from the worlds of comic books and popculture. Episode Twelve includes our Toy of the Week Feature on the Enterbay Leon (The Professional) 12: Figure and our Discussion Topic is “Movie Tie In Toys". If you can't use iTunes, you can download Episode Twelve here now! Click on the link to listen, or right click to save the file! The podcast will always be available from the “Podcast” tab here - but if you can subscribe and give us positive ratings at iTunes, that will help us greatly! Q: What influence did fan reaction have on the decision to rethink Mattel's DC 6" offerings? A: From MattyJL: I’m not sure what you mean. We always consider the fans when creating a 6” DCU line, but we also consider retailers and the appropriate channel to deliver fans their figures. We’ve been planning for quite a while to deliver something new in 2013 as the writing was on the wall. DC Universe All Stars was a band aid but getting us more in the right direction. Q: The Back to the Future Hoverboard is an exciting offering. Are there any plans for action figures? A: No, no plans for figures right now. Q: The cancellation of the Young Justice line leaves 6" collectors without a complete team. What plans are in place to address this? A: At this point, there are no plans to release the rest. Sorry! 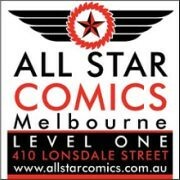 Additionally, we will not be continuing YJ on Matty.com in any scale (at this time). We tried a similar brand, JLU, in many form factors (singles, 3 packs, 4 packs and a 7pack of all new figures) and none sold well enough. This makes it a bit harder to continue YJ online. A toyline like YJ really takes Mom and Kid interest to keep it going. We cannot keep the line like YJ going on collector support alone. JLU proved this. Q: Will any figures in the 2013 Club Infinite Earths Subscription be determined by a fan poll? A: No. We won't be running a poll for the 2013 line, but we did look a lot at fan requests online! Q: The WWE Display Stands are excellent! Are there any other accessory or display type items planned for WWE? ​First off, thanks to everyone who commented on last month’s blog posts! Congratulations to "3B" of 3B's Toy Hive for being our randomly selected winner! Once we hear from 3B, (you can can PM your choice to "Andy" at the AFB Forum or email me at scott@actionfigureblues.com), his choice of either the either the Batman Legacy Series 3 Arkham Asylum Harley Quinn figure or the Marvel Minimates Wave 43 Jean De Wolff & Spider-Man Two Pack from DST will be on the way when available from Mike’s Comics N’ Stuff. Now to May's Contest: on offer are two great prizes, either the Arkham City Wave 2 Catwoman figure from DC Direct or the Marvel Legends Wave 2 Unmasked Dark Wolverine from Hasbro - either of which would be a great prize!